As one who types for a living, I often find myself shocked at the words my fingers produce without asking me first. It’s as if they go on auto-pilot, typing with a mind of their own. There’s nothing I can do about this, and we can all be thankful for my ability to edit the words my fingers type without first asking my permission. For instance, I’m so used to typing “Heavenly” (because I type HeavenlyHomemakers.com at least twelve times a day) that every time I write the words “heavy whipping cream” into a recipe my fingers automatically type “heavenly whipping cream.” In this case, I do think my fingers are brilliant because heavy whipping cream is quite heavenly, is it not? 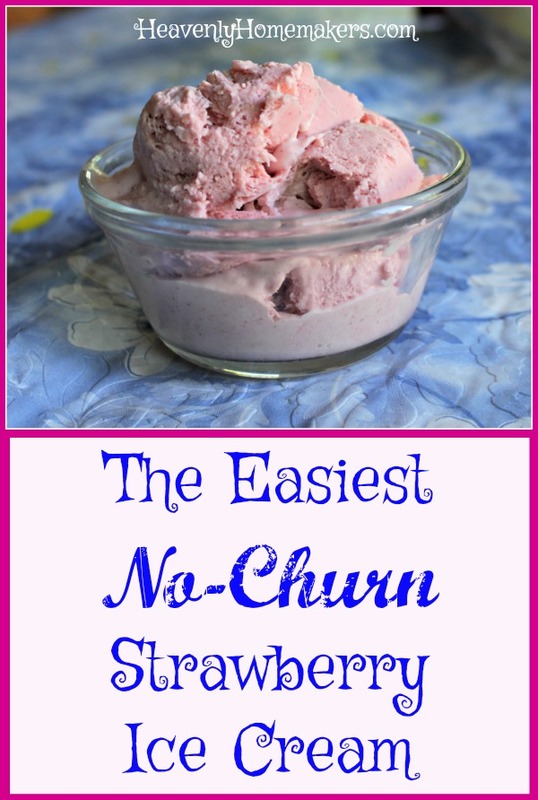 Without exception, each time I’ve typed the title of this recipe, it has come out like this: The Easiest No-Church Strawberry Ice Cream. Every single time. So this recipe is “the easiest” because you don’t even have to churn it. But no matter how much I concentrate on telling you that, my fingers type the words “No-Church” and this leads us to believe that this ice cream needs Jesus. Do not miss the irony of this, because as we’ve already discussed, this “no-church ice cream” is made with none other than “heavenly whipping cream.” Thank you, fingers, for keeping me on my toes and confusing my brain. From now on, please let me tell you what to write instead of taking matters into your own hands. Literally. Blend all ingredients thoroughly until smooth, creamy, and slightly thickened. Pour mixture into a 9x13 inch pan. Cover and freeze for 2-3 hours. Scoop out ice cream and serve! If Ice Cream is in the freezer for a long time, simply set it on the counter for about 15 minutes before serving to make it easier to scoop. If we do take this treat to church and people ask how it’s made, we can tell them about the “heavenly whipping cream” that is the not-so-secret ingredient that makes the ice cream taste so good. Who knew that an easy ice cream recipe could be the gateway to deep spiritual discussion? Who even knew? Want more No-Churn Ice Cream recipes? 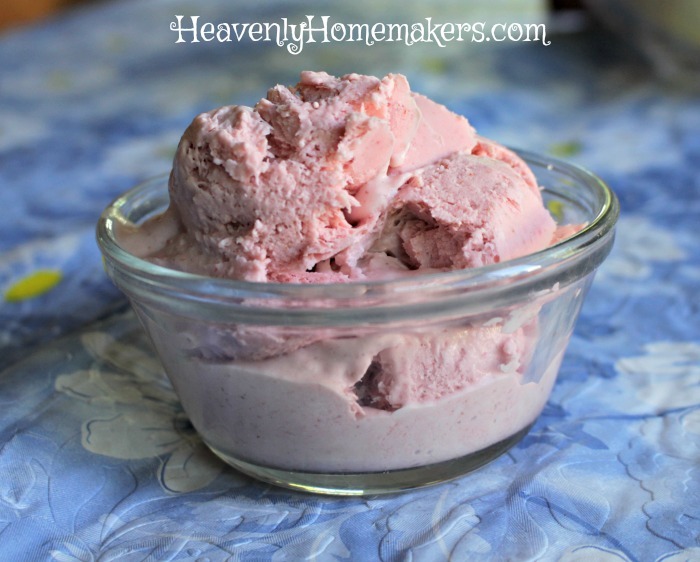 In this Strawberry Ice Cream recipe as well as the Chocolate and Vanilla versions shared above, replace maple syrup with stevia or the other way around. My preference is to use about 1 Tablespoon of maple syrup and about 30 drops of liquid stevia. The stevia cuts the sugar content dramatically while the maple syrup takes away any bitterness the stevia leaves behind. Enjoy not churning your ice cream. Or not churching it. Whatever. Do you think honey would work as a sweetener instead? Definitely! You’d probably want to use a little less than what the recipe suggests (more on the 1/4-1/2 cup end of the spectrum) since honey is so strong. But honey would definitely work! Have you tried this with other fruit like pineapple or blueberries? No, but I think it would work wonderfully! Laura, could you clarify the direction to “blend the ingredients”. You call for whipping cream here, so does “blend” mean in a blender – to simply puree it all together, with a hand/stand mixer on high – to actually generate whipped cream, or just with a spoon – to mix it all up? This looks yummy! I totally understand how your fingers write what they want even when that is not what your brain says. It happens all the time with me too! I am thinking about trying this with blueberries and honey because that is what I have. It does look heavenly, I’m super excited to make this at home this week! hmm, I wonder if this would work with canned coconut cream? My daughter is feeling better on less dairy milk these days. I do think canned coconut cream should work well! Has anyone tried this recipe in an ice cream freezer? I am considering making a quantity for church and thought “lugging out the big freezer” might be worth it in this case if it wouldn’t mess up the texture. Thanks!